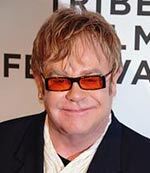 Elton John is a best-selling singer-songwriter, who, over a long career, has become one of the UK’s best-selling artists of all time. At the funeral of Princess Diana in 1997, Elton John performed ‘A Candle in the Wind’ at Westminster Abbey. The single was subsequently released and went onto sell 33 million copies worldwide – to become the best selling single in the UK. Reginald Kenneth Dwight was born in Pinner, Middlesex, a London suburb. His father, Stanley Dwight, was an officer in the Royal Air Force and was frequently away; his mother’s name was Sheila Harris. Reginald was educated at Pinner County Grammar School and Royal Academy of Music. He began playing the piano at the age of three and showed great talent. However, Elton remembers practising very little and being one of those students who could scrape a pass without any practise. Elton began performing in 1962, aged only 15. Known as ‘Reggie’ he performed popular ballads – before progressing on to recording music and ultimately his own solo career. Elton John has sold over 250 million records and has over 50 Top 40 hits, making him one of the most successful musicians of all time. John was one of the dominant commercial forces in the rock world during the 1970s, with a string of seven consecutive Number One records in the U.S. album charts. His achievements included 23 Top 40 singles, 16 Top 10 ones, and six number one hits. Elton John was engaged to his secretary Linda Woodrow in 1968. In 1976, he revealed to Rolling Stones that he was bisexual. In 1984, he married Renate Blauel. He later said he was homosexual. When civil partnerships were made legal, Elton John and his partner David Furnish were amongst the earliest to get a civil partnership. They have a son Zachary through a surrogate mother. In the late 1980s, Elton John was active in campaigning against AIDS. Partly through his interest in AIDS awareness, he came into contact with Princess Diana and they became friends before her death. His success had a profound impact on popular music and contributed to the continued popularity of the piano in rock and roll. Key musical elements in John’s success include his melodic gifts matched with the contributions of his lyricist partner Bernie Taupin. Outside of music, he is a big supporter of Watford Football Club and was made club chairman in 1976. In 2004, Rolling Stone Magazine ranked Elton John #49 on their list of the 100 Greatest Artists of All Time. Elton John was inducted into the Rock and Roll Hall of Fame in 1994 and was knighted in 1998.